The fourth volume of the documentation series about the work of Herzog & de Meuron 1997 -2001, the Swiss architecture practice is very much in the tradition of the previous publications. It still uses the Remy Zaugg homage cover. However, the office and the architects are now superstars and part of the leading elite in the architecture scene. This is visible in the publication very much in Herzog & de Meuron (HdM) fashion, as a neatly designed, understatement pretending firework of surprises. This doesn’t really go together but the Birkhauser publication in the 1. edition manages exactly this. A book able to reproduce exactly what the content is capable of in a very independent and clear manifestation of good design. 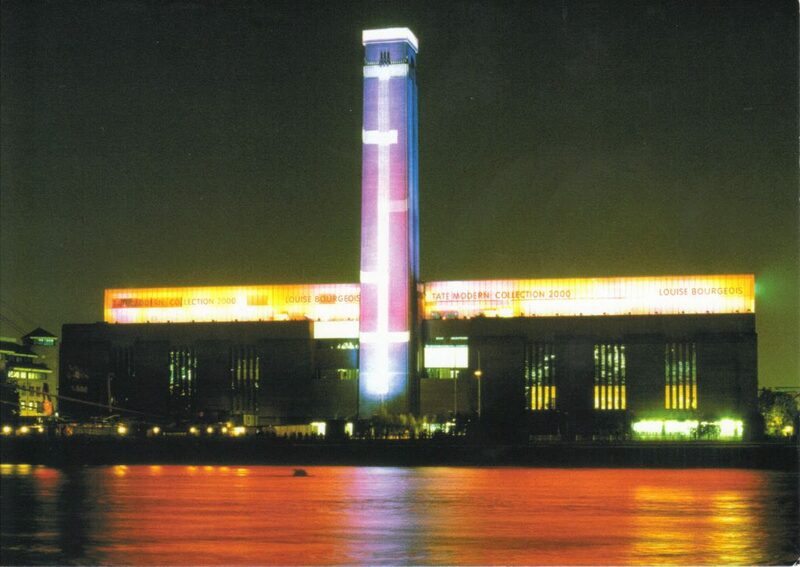 Image taken from postales inventadas / Night shot of the Tate Modern building, the former power station on the south bank of the River Thames. As the author Gerhard Mack points out in his introduction in between the third and this fourth publication about the work of HdM they entered the ranks of architecture superstars, mainly at first in connection with the Tate Modern museum project in London. However subsequently through out the documented period in this publication 1997-2001 they reinforce this position with every project and receive in 2001 the Prizker Architecture Prize. This publication pretty much covers the architecture icons a the turn of the century. Each project is very well known and had, most still do its very own impact on the architecture scene and beyond. A series of very large museum projects basically form the spine of this period. Starting with the Tate Modern Building in London, to the Expansion of the Aargauer Kunsthaus in Aarau, Switzerland, to the expansion of the Museum of Modern Art in New York, USA (project), to the Kramlich Residence and Media Collection in Oakville, USA, to TEA, Tenerife Espacio de les Artes Santa Cruz de Tenenerife, Canary Island, Spain, to the Schaulager, Basel, Switzerland, to Jack S. Blanton Museum of Art, Austin Texas, USA, to the de Young Museum, Goldengate Park, San Francisco, USA, to the Walker art Centre, Expansion, Minneapolis, Minnesota, USA, to the Expansion of the Kunstmuseum Basel, Switzerland (project) and the Caixa Forum in Madrid, Spain. 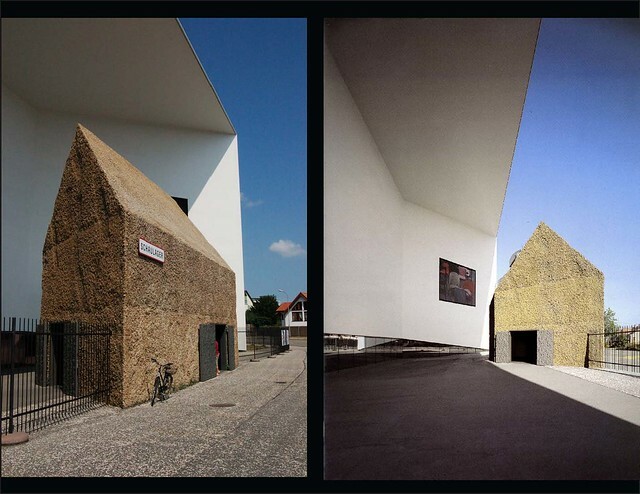 Image taken from Evan Chakroff / HdM – Schaulager, Basel, Switzerland, two views of the entrance with gate house. The cultural pojects has been one of the strength in HdM’s work. To add to the museums, there are libraries, dance studios, concert venues, conference centre as well as galleries and artist studios. In fact they have pretty much contributed to any of the large scale building project types you there have been in recent years. With some stadiums (football stadiums as their personal passion), shopping centres (check in with Gowalla), highrise projects, large scale residential and, you might not think so but also privat residential project. A sort of surprise in this publication is the privat business/residential project XXXX in Basel, Switzerland. It seems to be the first an only time this project has been extensively documented and published. It has a really fascinating roof concept, something HdM have developed further in following projects. A series of exhibitions is also part of this cycle and includes the ‘Exhibition Herzog & de Meuron: Naatural History‘ at the Canadian Centre for Architecture, Montreal, Canada. Their activities however not only focus on the building of architecture. The number of publications they have published is extensive and HdM are involved in different research projects as well as teaching. At ETH they run their own Studio since 1999, called ETH Studio Basel, since they are from Basel and it also is based on Basel, a unique situation for the ETH. This studio is run together with Roger Diener, from Diener and Diener, Marcel Meili, from Meili Peter. With a group of students the studio investigates different aspects of the urban context. This can sometimes be a longterm project involving changing groups o students as for example with the project ‘Switzerland an Urban Portrait ‘. Image taken from architechnophilia / De Young Museum, San Francisco, USA, detail of material and treatment. The publication is extensive and the projects each are documented carefully and in detail. It is not that this is just some book about Herzog & de Meuron, but this is the book about HdM. The author Gerhard Mack is working very closely with HdM and the office produces all the required content themselves. In this sense the office is almost co-author but at least contributor. In terms of the book design, for this volume new graphic designers were on board and this is really visible. The publication has its very own character. It is based on traditional very well structured book design, but extends, adds, ignores and overrules it where ever possible. There i a lot of playing with the font, sizing and borders, really keeping the reader on the toes, in a very good sense. the different sections are clear and distinct and together contribute tot he whole of the publication discussing different aspects. This includes the inside cover with the icons of each project right through to the last bit with the spread wide photographs of the different projects. In a sense the publication manages to extract the anatomy of the complete work only to bring it back together as a narrative of singular projects. Mack, G., 2009. Herzog and De Meuron 1997 – 2001: The Complete Works, Volume 4 1st ed., Basel: Birkhauser.